Hi all and welcome to another week on the Simon Says Stamp Wednesday Challenge. Thank you for joining us for the Make it Sparkle Challenge and we hope you will all join us again this week too. This week the challenge is Party! Yes, tomorrow is New Year Eve and it is time to party! Here is my party card. 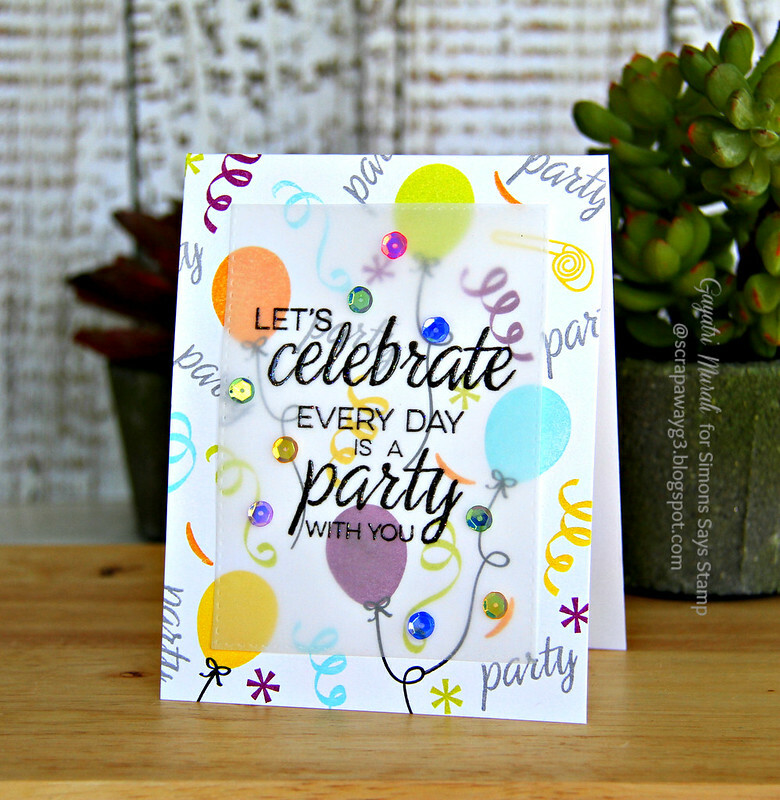 I used Winnie & Walter’s The Party stamp set to make my card. I stamped the background of my card with the images from the stamp set in a mixture of colours. I just wanted the burst of colours. I have used pigment inks from Mama Elephant and Avery Elle and Memento Luxe inks. Pigment inks remain bright as they sit on top of the cardstock. For the focal sentiment. I die cut a vellum panel using Simon Says Stamp Stitched Rectangle die set. This die set is my all time favourite. I use it all the time and most of my cards have the stitched rectangle panel in them 🙂 For this card, I used the third largest die from the set. 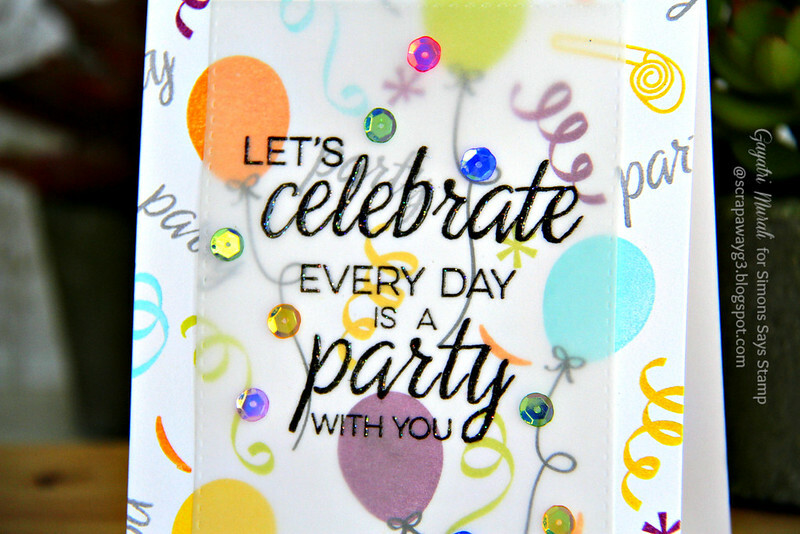 The sentiment is from Winnie & Walter The Party Stamp set which I heat embossed on the vellum panel. I added Multi Matt Medium to the back of the heat embossed sentiment to adhere the vellum on the card front. Then embellished with Pretty Pink Posh’s iridescent sequins. Here is a closeup of the card. While I had the stamp set on my table I made another card. I decided to try no line copic colouring using masking technique to stamp a cluster of images on this card. Just to push myself to do something new, different and outside my comfort zone. I love how it turned out. One thing I will do different is to stamp the image with fourth generation stamping with Memento ink instead of third generation. I can still see the outline in certain places. Otherwise all is good. Now no line copic colouring is within my comfort zone. Yay! Sentiment is also from the same stamp set which I stamped using black ink right below the coloured images. I then die cut the coloured panel using the smaller scallop panel from Essentials: Audrey’s Cutaway. I layered this panel on a white card front. Then I embellished the card with Clear Droplet from Pretty Pink Posh. These are both fabulous designs! Great cards! I love that the first one looks like a party right on the card! Love both the cards, Gayathri! The colors as so bright, bold and beautiful! Wonderful cards for our party theme, Gayatri! 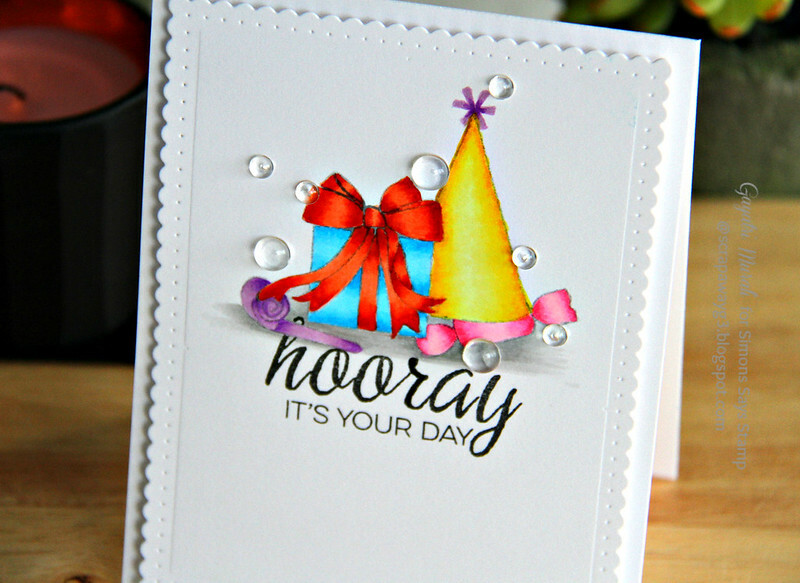 I love the way you use these vellum panels on your cards – it's something I want to try going forward! Wishing you a happy, creative 2016! Beautiful cards Gayatri!! Love the vellum panel! 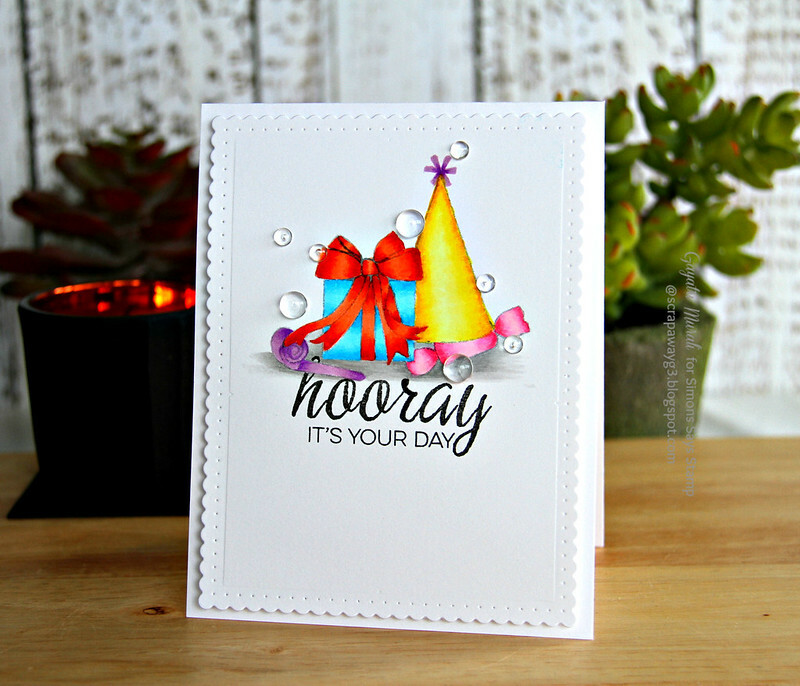 fantastic cards- gotta love all the bright colors! Thank you for a year of DT inspiration at Simon Says. Happy New year! Have a Great New Year and 2016!! Love the bright and bold designs – beautiful cards. Hope you and your family have a wonderful 2016! Thanks for brightening up my 2015 with your talent and creativity! Wishing you a Fabulous Happy New Year and 2016! Hooray! to you for trying something new. I love the way the no line coloring turned out. The first card looks so “party-like” with its bright colors, and I love the addition of sequins to a card.